For those of you who didn’t know, Simple Machines Forum (SMF) is a free, professional grade software package that allows you to set up your own online community within minutes. It is an open-source software which is written in PHP and uses a MySQL/MariaDB database. It provides many features and it is user-friendly. This article assumes you have at least basic knowledge of linux, know how to use the shell, and most importantly, you host your site on your own VPS. The installation is quite simple. 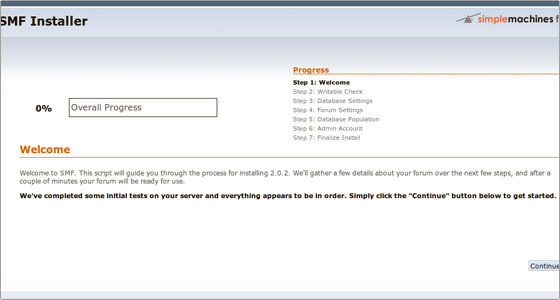 I will show you through the step by step installation Simple Machines Forum on CentOS 7. By default, MySQL is not hardened. You can secure MySQL using the mysql_secure_installation script. you should read and below each steps carefully which will set root password, remove anonymous users, disallow remote root login, and remove the test database and access to secure MySQL. Step 4. Configure Apache web server for SMF. Step 5. Accessing Simple Machines Forum. Congratulation’s! You have successfully installed Simple Machines Forum. Thanks for using this tutorial for installing Simple Machines Forum on CentOS 7 system. Related Posts of "How To Install Simple Machines Forum on CentOS 7"